This Quranic concept of the beginning and the end of the creation is undoubtedly extraordinary. It would not have been less amazing if it had been revealed to a highly educated person of our contemporary age, but one is wonder-struck by the fact that this most advanced knowledge, regarding the perpetually repeating phenomenon of creation, was revealed more than fourteen hundred years ago to an unlettered dweller of the Arabian desert. The surprising discovery of a supermassive black hole in a small nearby galaxy has given astronomers a tantalizing look at how black holes and galaxies may have grown in the early history of the Universe. Finding a black hole a million times more massive than the Sun in a star-forming dwarf galaxy is a strong indication that supermassive black holes formed before the buildup of galaxies, the astronomers said. The galaxy, called Henize 2-10, 30 million light-years from Earth, has been studied for years, and is forming stars very rapidly. Irregularly shaped and about 3,000 light-years across (compared to 100,000 for our own Milky Way), it resembles what scientists think were some of the first galaxies to form in the early Universe. "This galaxy gives us important clues about a very early phase of galaxy evolution that has not been observed before," said Amy Reines, a Ph.D. candidate at the University of Virginia. 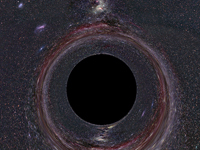 A Black Hole is a gravitationally collapsed mass of colossal size. It begins with the collapse of such massive stars as are 15 or more times the size of the sun. The immensity of their inward gravitational pull causes the stars to collapse into a much smaller size. The gravitational pull is further concentrated and results in the further collapse of the entire mass into a supernova. At this stage the basic bricks of matter such as molecules, atoms etc. begin to be crushed into a nondescript mass of energy. Thus that moment in space-time is created which is called event horizon. The inward gravitational pull of that something becomes so powerful that all forms of radiation are pulled back so that even light cannot escape. A resultant total darkness ensues which earns it the name black hole, reminding one of the word ratqan used by the Qur'an indicating total darkness. This is called singularity which lies beyond the event horizon. A resultant total darkness ensues which earns it the name black hole, reminding one of the word ratqan used by the Qur'an indicating total darkness. This is called singularity which lies beyond the event horizon. A black hole once created grows rapidly because even distant stars begin to be pulled in with the progressive concentration of gravitational energy. It is estimated that the mass of a black hole could grow as large as a hundred million times the mass of the sun. As its gravitational field widens, more material from space is drawn in at a speed close to that of light. In 1997 there was observational evidence suggesting that in our galaxy a black hole of 2,000,000 solar masses existed. But other calculations show that in our universe there could be many black holes as big as 3,000,000,000 solar masses. At that concentration of gravitational pull even distant stars would stagger and lose their mooring to be devoured by a glutton of such magnitude. Thus the process of ratqan is completed resulting into that singularity which is both completely closed as well as comprising total darkness. In answer to the question as to how the universe was initially created, the two most recent theories are both Big Bang theories. They claim that it was initiated from a singularity which suddenly erupted releasing the trapped mass leading yet again into the creation of a new universe through the event horizon. This dawn of light sprouting from the event horizon is called the white hole. One of the two theories relating to the expansion predicts that the universe thus created will carry on expanding forever. The other claims that the expansion of the universe will, at some time, be reversed because the inward gravitational pull will ultimately prevail. Eventually, all matter will be pulled back again to form perhaps another gigantic black hole. This latter view appears to be supported by the Qur'an. The clear message of this verse is that the universe is not eternal. It speaks of a future when the heavens will be rolled up, in a manner similar to the rolling up of a scroll. Scientific descriptions illustrating the making of a black hole, very closely resemble what the Qur'an describes in the above verse. A mass of accretion from space falling into a black hole, as described above, would be pressed into a sheet under the enormous pressure created by the gravitational and electromagnetic forces. As the centre of the black hole is constantly revolving around itself, this sheet—as it approaches—will begin to be wrapped around it, before disappearing into the realm of the unknown at last. ... As We began the first creation, so shall We repeat it; a promise binding on Us; that We shall certainly fulfil. Following the eventual collapse of the universe into a black hole, here we have the promise of a new beginning. God will recreate the universe, as He had done before. The collapsed universe will re-emerge from its darkness and the whole process of creation will start yet again. This wrapping up and unfolding of the universe appears to be an ongoing phenomenon, according to the Holy Qur'an. Please type '147' into this field.